MesoPalladium is a true colloidal palladium mineral supplement and has the highest particle surface area for maximum effectiveness, it is a 0.9995 pure palladium in colloidal form. 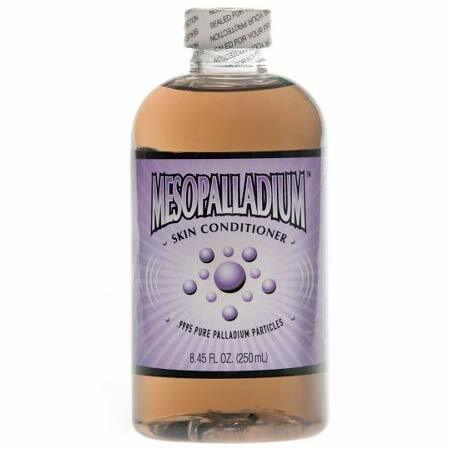 MesoPalladium is an all natural mineral supplement in the form of a palladium colloid consisting of nanometer particles of 0.9995 pure palladium suspended in pure deionized water. Mesopalladium is a true colloid and consists entirely of nanometer size metallic particles palladium and no palladium ions. Purest Colloids, Inc. is the exclusive worldwide producer of MesoPalladium. MesoPalladium is manufactured in an FDA registered facility, contains only pure water and pure palladium and is non-toxic. You should not use this product if you are allergic to palladium! Allergic reactions to palladium, while not unheard of, are uncommon. Someone having an allergic reaction to palladium would not be able to handle a metallic palladium object without causing an allergic reaction. Those who are uncertain if they are allergic to palladium should apply a few drops to the back of the hand to see if an allergic reaction results. If you do not see a reaction within 30 minutes you can be fairly certain that you are not allergic to palladium. The dosage for MesoPalladium is typically one teaspoon (5mL) daily or as recommended by your health care professional. One teaspoon contain 50 micrograms of metallic palladium. A 250 mL bottle will provide a 50 day supply when used at a dosage of one teaspoon per day. MesoPalladium is clear light silver coloured liquid. There is no noticeable turbidity (cloudiness).